An excellent deal on a mainstream load built for bulk shooting, but because of the history and manufacturing protocols of the producing company is actually a high-performance round in a bulk shooting case lot that offers a lot more for the money, especially to those looking for a relatively accurate round at a bargain price. 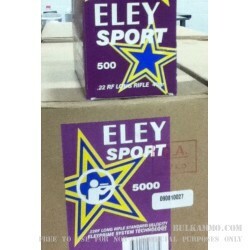 This is a 5000 round case lot of premium Eley Sport loads with a 40 grain lead round nosed projectile that is perfectly suited for target practice and plinking at distance. This round can also be used for hunting but is best suited in that purpose for ultra-small game and at moderate ranges out to about 80 yards, where the slightly slower moving projectile can have the best impact and still maintain the nice trajectory from its engineering. The load can be used up to about coyote (that is the extreme upper end) in size for varminting, but it is best utilized in a short range setting as noted above. This is a very good round for those who just want some bulk on their shelves, but also want a consummate performer for use with match grade guns without overpaying for the privilege of a premium round. 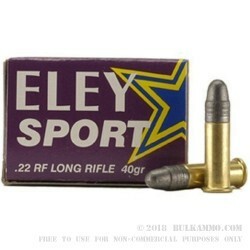 Admittedly, this is not Eley’s most accurate load, but it is still made under the same tight precision metrics they make all their ammunition based upon and therefore is a steal.